I just got an email from NSCA soliciting Strength coach of the year nominations. Let me preface this by saying that these types of awards are ridiculous. Mostly popularity contests given those with winning teams with no understanding of what goes on behind the scenes. That being said I have a nomination – I nominate Joe Anonymous, Joe is the coach Podunk High School, a school of 800 students in the middle of Florida. He has a 300 square foot weight room with no benches, dumbbells, three Olympic bars and three squat racks, no air conditioning, but he does have a concrete pad outside his weight room that is 800 square that he laid himself. He works with 23 sports boys and girls and he has no help. He does it all by himself. He does have a an iPad that he bought himself that he uses to video the athletes. He arrives to work at 5:30 AM to get ready for the first group of athletes who start at 6:00 PM. He has three groups before school and then he teaches five periods of history and then starts again at 3:00 PM to 6:00 PM. During the summer he works with the athletes from 6:00 to 9:00 AM and then from 4:00 to 7:00 PM. He does this for a coaching stipend of $1500 that he uses to buy equipment. He has had zero ACL injuries the last four years. The teams are competitive, not great but they are healthy fit and functionally strong. In this post I will give you some ideas on Training Session Management. Training session management is the cornerstone of the coaching management functions because it occurs so much more frequently than the other two. Make sure that the session fits in the context of the whole plan in regards to the microcycle, block and yearly plan. Have a theme for each session; it can be as simple as just one word that you and the athletes can focus on to set the tone for the workout. This is not to be confused with the objectives of the workouts. Objectives are very specific and measurable outcomes you hope to achieve in the workout, I usually have no more than two objectives per workout. On the workout sheet list the equipment needed and when and where in the workout I will need it. I make sure all equipment is working. If it requires electrical power make sure the batteries are charged and the outlets work. Also list the personnel you will need, where and when they will be needed, and make sure they are fully briefed before the workout begins. The next step is to have a detailed plan for the entire workout and a contingency plan in the event of inclement weather or facility unavailability. Keep it simple; I have a tendency to make workouts too complicated with the end result confused athletes. Start with introduction of the theme and special instructions to the group. Plan complex movements and high skill demand activities early. Speed development should be planned for early in the session before there is any fatigue. If possible try not to mix high neural demand activities with high metabolic demand activities in the same session. If there are groups in the workout be sure to assign the groups and leaders in advance. Make sure that transitions between segments of the workout are set up to allow flow from one segment to the next with minimal time loss. Be sure to allow for intra workout recovery and nutrition breaks if necessary. Within the workout focus on the sequence, order and timing of the exercises you chose to accomplish your training objectives. If you have a digital timer to keep track of the time of segments that is a very helpful tool to manage the workout. Carefully record results and observations for future reference. At the end of the workout be sure to evaluate the workout in the context of the objectives. Were the objectives of the workout achieved and if they were not, why not? What were the highlights? Were there any particular individuals that needed special attention or were unable to accomplish parts of the workout? What stood out about the workout that was particularly effective? These ideas may seem obvious to some, but this is the stuff that makes or breaks you as a coach and it is not taught to young coaches any more. Please feel free to add any ideas or suggestions you might have that I have missed, always interested in other ideas and perspectives. Running - Improve ability to use the ground and be able to tolerate the amount of running necessary by avoiding impact injuries such as tendonitis. These demands create a different approach to strength training. The strength goal is work on movements that improve posture and alignment. In swimming the goal should be to strengthen the core and legs and properly strengthen the upper body so that the athletes can improve their distance per stroke and achieve a better alignment in the water. In cycling, a large part of efficiency is to ability to hold an aerodynamic position, which demands a large amount of core strength, stability in the shoulders and obviously functional leg strength. In running, efficiency is a matter of optimizing stride length with stride frequency, and all require strength endurance. There is a mistaken notion that one has to go to the gym to do strength training. No excuses, you don’t need a weight room, instead think of a “weight room without walls.” Equip the no wall weight room with a set of dumbbells of 10 to 25 percent of body weight; a sturdy box or bench 12 to 14 inches high; a 3 kg medicine ball and a stretch cord. With these items one can do anything you need to do to build functional strength for swimming, biking and running. (3) Upper body, which includes more body weight movements such as pull-ups, push-ups and their variations, and core strength work. The 20-Minute Day - The selection of exercises includes two total body movements (done as an emphasis for the workout), one or two leg exercises with one or two upper body movements. The 10-Minute Day - This is devoted to core strength development working on rotational movements. It is a misconception that since the movements of running and cycling is linear in nature that there is not a great deal of need for rotational movements. Quite the contrary, the control of rotational movements that is necessary in order to be more efficient. As the season progresses and the competition schedule increases in number and importance, this 20/10 x 6 can be reduced to two of 20 and three of 10. It’s possible to do the strength training work pre-swim and not have it affect the quality of the swim workout. With cycling, if the workout calls for steady medium intensity, then some core and upper body work before hand can be beneficial. However, in running, because of the high eccentric component, you could do core work beforehand but total body, upper and lower body work would be not be advisable. The overriding principle is to never compromise the quality of the bike, swim or run as a result of a strength-training workout. Some of these considerations are also dependent upon an athlete’s training age and background. Another option is doing a strength workout early in the day and the swim, bike or running workout in the afternoon as a way to address the problem of getting the workout done. 20/10 x 5 - Twenty minutes three times a week and ten minutes two times a week, a simple formula to better injury free performance. What are disadvantages of using unstable surfaces? The inherent disadvantage of using unstable surfaces is that the ground moves under you. This only happens in a few sports. If the surface is too far away from the normal competition surface there is a risk of developing a skill set that makes them able to handle the very unstable surface but has no relationship to the actual activity. The danger is that overuse of the unstable surface will create artificial stability. Artificial stability is a stability that is adapted to the specific task required by the unstable surface, but is of questionable value in regards to transfer to actual performance. The stability gains need to transfer or it is time wasted. Beware of turning the use of unstable surfaces into circus tricks. A good example is standing on a physioball, except for a very few sports that is no carryover, it is a discrete skill that stands alone. There is no need to learn that to improve sports performance. That time would be better spent doing more sport appropriate activities. A sound approach is to create instability through movement. Is the normal environment enough? Can we simply employ a few environmental modifiers? An environmental modifier is anything that creats an increased propriocpetive demand that elicts a response that is similar to that requires by the movements of the sport. So the questions you must ask are: What will transfer? What will not transfer? What will create a skill set that will not transfer? Injury Prevention - Scandinavian and Italian studies prove their value for prevention using unstable surfaces as part of warm-up. Performance Enhancement – There is not much hard data in this area, the results are basically anecdotal. Rehabilitation from an injury – This proceeds from very controlled closed skills to open reactive movements that indicate an ability to react and utilize the surface. There is certainly significant overlap between the three; in essence it is a continuum. How much should you use unstable surfaces once the sport demand has been assessed? It is best used as remedial work preceding warm-up in an injury prevention mode. For performance enhancement it should probably be placed within the body of the actual workout. It is probably most compatible with agility work or lower body strength training. Success or failure in most over ground sports is determined by how effectively the athletes are able to use the surface they compete and train on. The surface will give back energy or dampen force. Where possible a good step is to take the shoe out of the equation. Perhaps the simplest way to manipulate the surface is the do some activities barefoot. Because of the abundance of proprioceptors in the bottom of the foot this affords the possibility for heightened sensory input. Explore the simple and obvious before going to the complex. Work barefoot will have a quick and obvious transfer. Sand - Sand is a viable unstable surface to in both training and rehab. Just like any surface it has some limitations. The primary downside is that the softness of the sand significantly slows everything down. It dampens the elastic response, which is both a plus and a minus. It is a plus because it develops good concentric strength response. It is a minus because it negates elastic response, so it is not real life. That being said sand enables big angles and aggressive movements that allow the athlete to push the edge in terms of lateral movement. High Jump and Pole Vault Pit - The depth of the pits dampens impact so it is a decision of how much do you want of this. This virtually eliminates any elastic response. The work on the pit is dominated by concentric muscle action. This is a good surface that can be used for canoe or kayak to simulate the training or competitive environment on dry land. Trampoline - Very responsive, obviously bouncy which is good for body awareness and control. A trampoline is a good surface to work on landing and sticking the position to create stability. Gymnastics Floor Exercise Floor - There is a very predictable response from the floor. A very springy surface. Good surface to work on barefoot. Resilite Wrestling Mat - This surface is not as responsive as a floor exercise floor. Good for multidirectional activities because of the size of the mat. Another good surface for barefoot work. Foam Pads - Smaller high-density foam pads are good for static balance activities. This represents a very controllable instability. K boards - Good to great side-to-side instability. The pivot point of the board only allows movement in the frontal plane. Wobble Boards - The pivot allows three hundred and sixty degrees of motion, so this creates a rotational instability. BOSU - (This is not meant as an endorsement of the BOSU.) Using the flat side allow three hundred and sixty degrees of motion as well as a tipping effect. The degree of instability is determined by the inflation level of the BOSU. Leather Medicine Balls - These are great to step on and off or one onto another in a stepping stones patterns. They are very effective when combined with a several BOSU’s. Excellent tool for ankle and knee stability. Balance Beams - The edges of the beam should be beveled to create a bit of instability. This allows movements forward back and side to side. Also good apparatus to use for single leg squats. Remember not all surfaces or apparatus are appropriate for all situations. A good craftsman knows how to effectively use the tools in the toolbox; a hammer cannot replace a screwdriver. These surfaces and apparatus are analogous to the skilled craftsman’s tools for the coach and therapist. Use them sensibly, more is certainly not better, be very specific. It is beneficial to introduce a play element – this will allow the athlete to playfully explore the dimensions of movement required by different surfaces. In the mid 1970’s Arthur Jones invented a new machine system designed around an elliptical cam. The Nautilus system was based on accentuated eccentric loading and one set to failure. It was not that these were the first machines, but they were the first machines that were marketed with a training system and philosophy to back them up. Nautilus centers sprang up all around the country. Several high profile pro football teams and prominent collegiate programs adapted the system. It appealed to the American mentality of instant gratification. It was hard work, it hurt, and the workout was over in twenty to thirty minutes. In addition because of the eccentric emphasis it was possible to gain hypertrophy rather quickly, which appealed to American football. Things began to change rapidly with the advent of the full-time professional “Strength Coach.” In the seventies few colleges had strength coaches and if they did most of their attention was centered on football. In professional sport there were few fulltime strength coaches. In 1976 Bob Ward, who was the track coach at Fullerton College in California, was hired by the Dallas Cowboys. He had a full time year around program that was backed by management so that the player’s had to comply. This was a game changer. It was the exception, not the norm. Superior talent and genetics continued to prevail even into the late 1980’s. Not all the teams in professional football had fulltime strength and conditioning coaches. The advent of the strength coach in college and professional sport was like a good news bad news joke. The good news was that now there would be someone who whose sole responsibility was to condition the athletes. The bad news was that was that with the exception of those who had a track and field background they seldom got out of the weight room. In the mid eighties the research of Garhammer, Stone and O’Bryant on the periodization of strength training represented a significant breakthrough. Their work quickly became the accepted norm and in many circle sis still practiced today. It was a model that I quickly found out that it worked for someone just starting a strength program, but once they used the model once it required modification. The fallacy here was that strength was periodized independent of the other physical qualities. Strength is one quality that must be integrated with all other qualities. In 1985 I began my foray into professional sports with the Chicago White Sox and the Bulls as an assistant to Al Vermeil. Once again the same old myths and misconceptions which I thought had been forgotten reared their ugly head. You would have thought that by 1985 with the success that athletes had enjoyed world wide with a comprehensive conditioning program that the coaches and athletes would have been embraced this training as an opportunity to better themselves. I think since that there had been little emphasis on training in professional basketball and baseball the attitude on the part of the coaches was let them play, those who are talented will succeed and those who are not will fall by the wayside. I kept hearing that Basketball and baseball was different. Don’t lift heavy because it will hurt your shooting or impair your throwing and hitting. The White Sox trainer told me that pitchers should not lift overhead because it would hurt their shoulder. When I stated that didn’t they lift their arm overhead when they pitched I was told I didn’t understand the game. In 1987 I took over as Director of Conditioning for the Chicago White Sox. It was an opportunity to put together a systematic comprehensive program in professional sport. No one in professional baseball had a systematic year around program. In order to make it work I decided that we needed to make the program more specific to the demands of the sport of baseball. It needed to include more work on balance and proprioception and significantly more work on rotation. In my search for new methods and concepts I was influenced by Dr. Lois Klatt, head of the Human performance Lab at Concordia University in River Forest, Illinois and the book Total Body Training Bob Gajda and Robert Dominguez. I gradually moved away from weight training to the concept of strength training. Weight training is one method of strength training, in order to train a complete athlete it is necessary to utilize all methods available to achieve the desired goal. What evolved was a functional strength training program that was adapted to the multi-plane demands of the sport of baseball as well as the unique demands of the specific positions. The program was based on biomechanical analysis so that the movements we were training were specific. Pitchers had a specific program; catchers had a specific program, rather than one program for all. All these programs had all components linked so that what was done with speed and agility training was related to balance and proprioception work which in turn was related to the strength training work. My goal with the White Sox was to create a model that would work in any sport. I was lucky to be able to use the resources available to work toward accomplishing this task. We were able to achieve good results with the White Sox both in terms of measurable improvements of speed and power as well as significant reduction of injuries. In 1987 I had the opportunity to attend the European Athletic Coaches Association Conference in France. At that conference I was introduce to the concepts of strength and power development of a French sport scientist, Gilles Cometti. He had a big influence on the design of the strength training of the three time world champions Swiss Shot Putter Werner Gunthor. His methods involved combinations of slow and fast eccentric work. Isometric holds for as long as sixty sends and ballistic explosive work. I applied these ideas with good results, but still was not quite sure where it all fit in the system. In the nineties I continued to refine the ideas and concepts I had learned over the previous twenty years. Another piece of the puzzle was a research article published in 1993 by Wilson, Greg J., Newton, Robert U., Murphy, Aaron J. and Humphries, Brendan J. “The optimal training load for the development of dynamic athletic performance.” Medicine And Science In Sports And Exercise Vol. 23 pp. 1279-1286. I think article in many ways closed the circle for me. It answered some questions and raised some other questions. It is interesting to note as we supposedly gained more knowledge and sophistication in the field I began to see more monkey see, monkey do syndrome. If it is good for them and they just won the national championship then it must be good for us. There is a prevalent attitude that the greatest testament for a piece of equipment or a particular training method is the affirmation of winning. What I have seen through my experience is that success is often achieved in spite of, not because of the training and that superior talent and genetics oftentimes prevail. A good sound training program is not based on equipment or personalities, but on sound scientific training principles. We need to consider what is really high tech? A machine for every body part with everything connected to a computer is not the answer. What is more high tech - the machine or the body? I have come to the realization that the body is the ultimate high tech machine. The farther away we get from the body the less specific the training. Where are we going? What have we learned? The key is the ability to apply the strength to the sport or in your event. That is what Sam Cunningham was trying to tell me in my first year of coaching. Just because he could not lift more weight that is not what is most important. The ability to recruit and fire the muscles in a coordinated pattern is what is most important. Strength training is about neural drive; it is training the command and control system. That is why it is so important to train movements not muscles! I now define strength training as coordination training with appropriate resistance to handle bodyweight, project an implement, resist gravity and optimize ground reaction forces. It demands training across the whole spectrum of strength and power depending on training age, physical maturation, gender and time of the training year. It involves a variety of methods systematically applied starting with the ability to handle and control bodyweight against gravity. This is where we have to go in order to progress to do a better job of integrating strength training, making it specific in order to develop athleticism. After forty years the journey continues. I believe it will always be a work a work in progress. There is a plethora of training equipment on the market today. Some of it is very fancy, very “high tech,” and expensive. My experience has shown that equipment is not the answer, no matter how fancy and high tech. You quickly become a slave to the equipment; the focus shifts off the athlete you are coaching and squarely on the equipment. Once you pay top dollar for a piece of equipment or a gadget there is a subconscious obligation to use it and you end up using it even if it is inappropriate to use. A group that I worked with purchased (Against my advice) a cold laser device that cost $20,000 soon everybody was hooked up to it whether they needed the treatment or not. It may have been appropriate for one person; it certainly was not for everyone. Another team I consulted with installed a $350,000 underwater treadmill before I was consulted. They used it for everything; they had to justify the expense. It was inappropriate for many of the situations it was used for. It was forced into the program to the exclusion of more effective methods resulting in prolonged rehab and inhibiting return to play. Stop to think and analyze before you purchase. Get beyond the hype and marketing. Does the equipment do something significantly better than you are doing now? Don't be swayed by those who endorse it, they were either paid or got the equipment free. Over the years I have found less is more. The farther away you get from the body the less effective the training, that is the bottom line. All the random number generators, machines with dials and alarms that go beep are no substitute for an experienced coach with a good eye and a feel for movement. I am a minimalist, start with the bare minimum and build from there as needed. Instead of putting money into facilities and equipment, invest in human resources; good coaches will produce good athletes. Athletes will get better with good coaches that implement a well-designed systematic program to fit the sport the athlete! The first pace calculator was The Oregon Pace Rule, developed by Jack Berg, Ph.D., Bill Bowerman’s Track Assistant back in the early Sixties. Jack was a four star athlete from Roseburg, Oregon, and came to school to compete. Jack had vaulted for Bill in the mid to late 50’s and I believe he was the Northern Division Champion at 13 feet 6”. Jack was a Chemistry professor at the University and very bright. He designed the Oregon Pace Rule from his own desire to help Bill figure out track paces quickly. As a distance runner for Bill I was an early recipient of The Oregon Pace Rule. I bought a few of the pace calculators from Jack in the early 70’s while I was in Eugene going to graduate school. By about 1982 the pace calculators had worn so badly that I needed to get a new one from Jack. Unfortunately Jack had passed away a few years earlier from cancer and I was unable to locate his widow to buy them. So in 1983 I started to research the process for developing a new pace calculator. New tracks were being built in meters so it seemed reasonable to have the new pace calculator to meet the needs of those school coaches with metric tracks. I added all of the road distances from 10 Kilometers to the Marathon so recreational and serious runners could figure out mile splits and it could double as a track coach’s tool, too. This process took close to eight months before I got my first prototype. The pace calculator has been through three changes since 1984 with the additions of the 150 and 500 meters as requested by coaches, change in plastic cover to paperboard like the original Oregon Pace Rule for environmental and cost reasons. By the way the machine only cost $14,000 but it works magic. 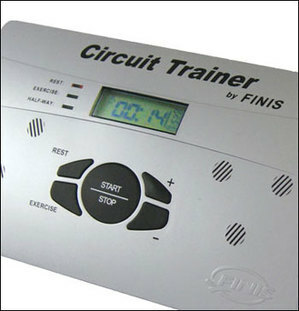 I have been privileged to work closely with Finis www.finisinc.com on the development of their latest product – The Circuit Trainer. This is a perfect coaching tool for use in the weight room, in the gym and on the field to set tim es for segments of workout to help manage your training sessions and to conduct time based circuit training workouts. It is small, battery operated and LOUD if you want to set the tone loud enough to be heard out on the fled or in a noisy weight room. It is compact, very easy to use, it can be quickly changed to adjust the workout. You can buy it on my web site. http://ww w.gambetta.com Look at the video to see how it works.www.gambetta.com/video/circuittrainer.html For me this is necessary tool for keeping me on task and improving the efficiency of my workouts.